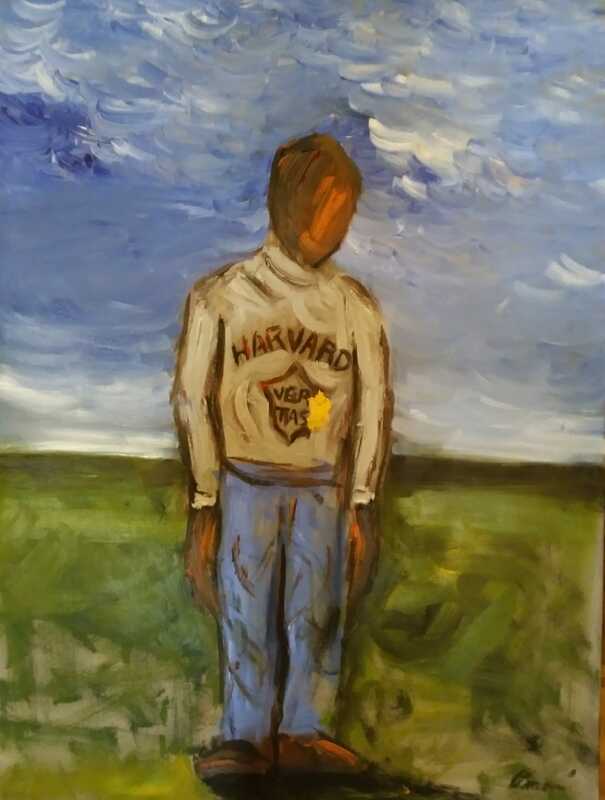 "My Dad Went to Harvard" by Omari Booker. Omari Booker is a Nashville painter. His current show, "I Live Here Too" is showing at abrasiveMedia through May 16th. 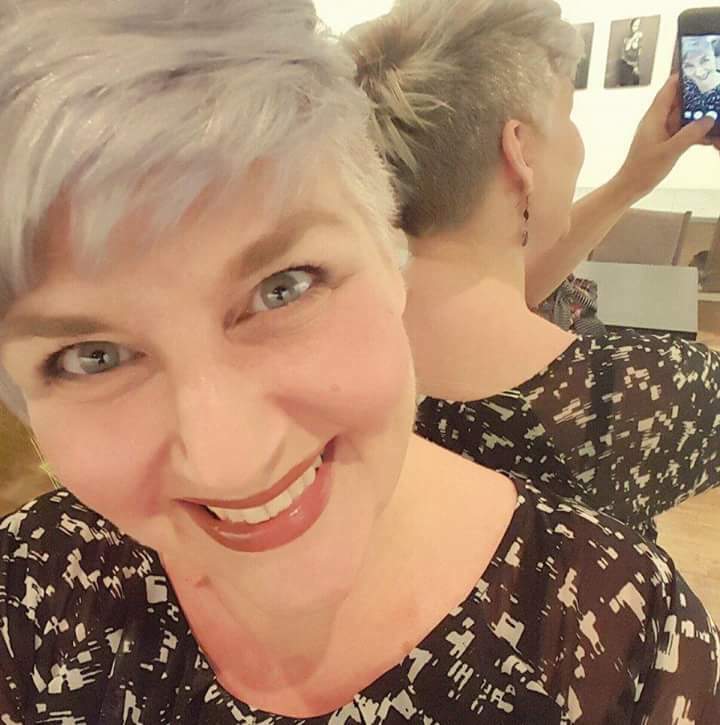 Kristin Chapman Gibbons is a Teaching Artist with abrasiveMedia. She is also the founder of True Stories Let Loose, which is producing Story Booth Nashville (Facebook link). Omari Booker is an artist who likes to take you places you may not want to go. When I interviewed him at his West Nashville studio in March, he told me that this show is all about uneasiness…his, and yours. 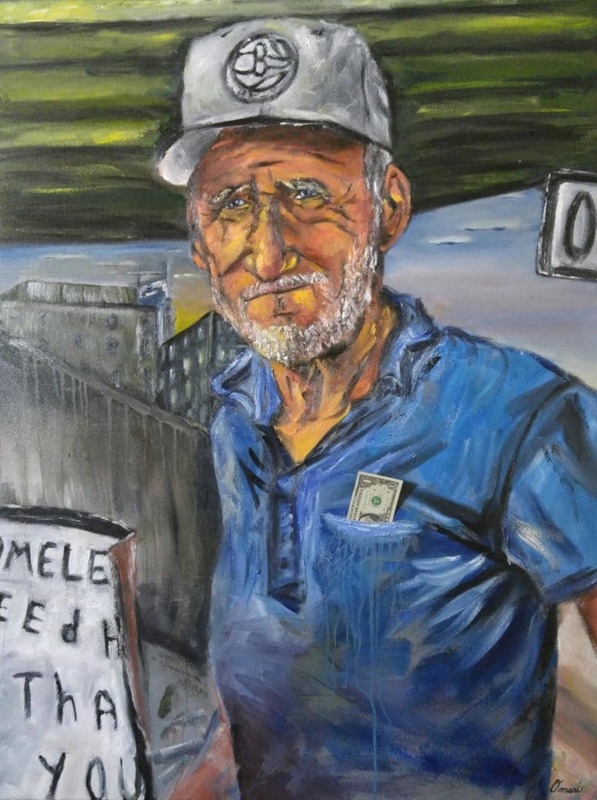 He started with a question, “Why am I so uncomfortable when I drive by this homeless man? Some of [the homeless people I pass] I see more than my mom! I wasn’t thinking of art necessarily, but the idea [for this show] came out of noticing. I needed to look at my discomfort, to look at my own tendency to look away.” This collection of paintings asks you to confront your own tendency to look away. After a tour of Omari’s studio, we settled in on the deck for a conversation about freedom and the role of an artist. “It’s our job as artists to be awake and to see. If you are going to be good, in my opinion, you have to be awake. You have to see. You can’t go back to sleep.” In encountering subjects with experiences different than his own, his compassion grew, and he was able to access a richer expression of humanity. Omari’s own history gives insight into why waking up is so critical for survival. The paintings in “I Live Here Too” are a repudiation of the blindness of bias. "Creative expression was my way back to tenderness..."
It was also around this time that he was introduced to Viktor Frankl’s Man’s Search for Ultimate Meaning through the Higher Education Initiative. Omari credits the book with helping him create “humanizing experiences in a dehumanizing place.” He still has the copy that he was given while he was in prison. He also gives props to hip hop for helping him find his voice. Omari said that hip hop is easy to dismiss but, “it teaches you ‘The Game.’ It is truth-telling. 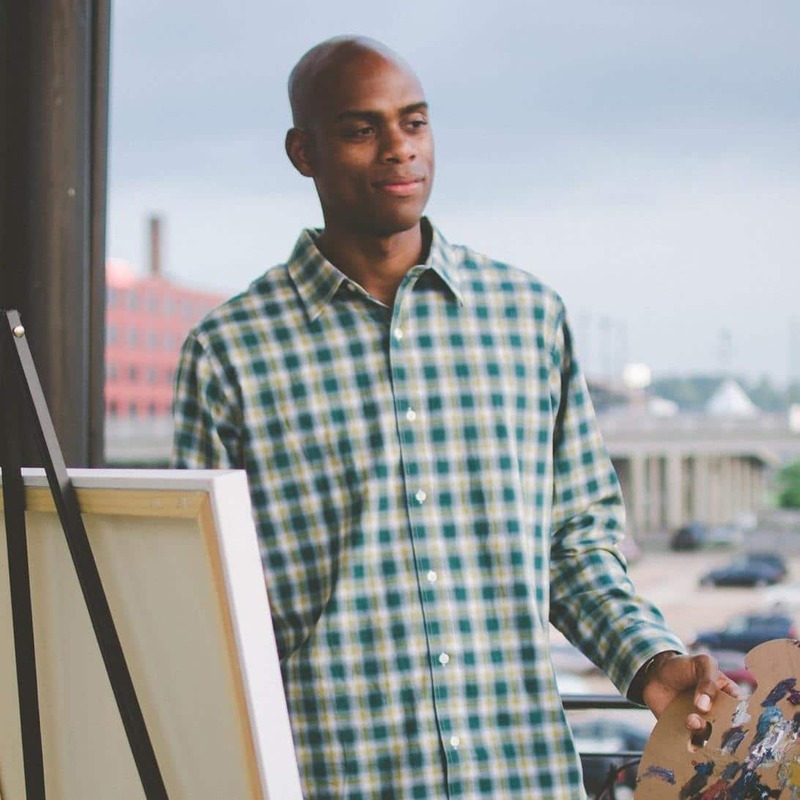 It shows you there is a way to be yourself and be successful.” Through painting, reading, and music, Omari was searching for ways to connect to his own humanity, even as he was being denied it. He picked at the scabs of his own stories through his art, confronting his blind spots with unflinching truth and profound empathy. "How Much a Dollar Cost" by Omari Booker. “Art is the space where I can take the mask all the way off." Omari Booker is no longer in a dehumanizing place. Instead, he uses art to revisit painful and truthful moments in his own life, and in the lives of others. The afternoon after I left, he was preparing to paint a particularly difficult memory from when he was in the sixth grade. He recalled that he was wearing a Harvard sweatshirt. Even though his father attended the university, he felt “oddly ashamed” to wear it. Another kid in his class commented about the sweatshirt, saying “a n*gger shouldn’t wear it,” and then spat on him. “I held that image,” he said, “the stain from that spit never came out.” He knew that it would be emotionally challenging to paint but he felt he was ready. Omari completed this painting after we spoke and it is shown in the current collection. You can see Omari’s show “I Live Here Too” through May 18th at abrasiveMedia.